'Bottle Of Bliss' (Barry Blyth, R. 2012) Seedling #U54-1. IB, 22 (56 cm). Midseason bloom. Standards creamy lemon, soft peach midrib and faint violet flush at base; falls cream with smooth outpouring of soft apricot; beards bright tangerine with outer 1/4" lavender. Seedling #S95-1: (seedling #P57-3: ('Gigglefit' sibling x 'Aquiver') x 'Dime') X seedling #R62-2: (seedling #O228-4: (seedling #L133-7, 'I'm Dreaming' sibling x seedling #L304-1, 'Platinum Class' sibling) x 'Adoree'). Tempo Two 2012. 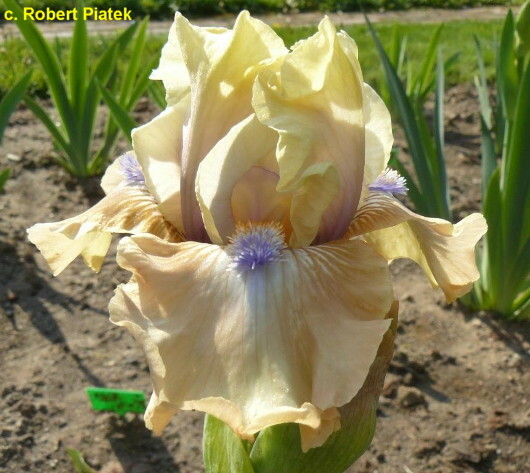 Hybridizer's Comment : One of the prettiest intermediate iris we have. A favourite by all who see it. Standards are creamy lemon with soft peach midribs and a faint violet flush at base. Falls are creamy pink with a smooth outpouring of soft apricot. Beards are bright tangerine and the outer ¼" is lavender. Good branching. jpg bottleofbliss2.jpg manage 144 K 08 Apr 2019 - 23:07 Main.TLaurin Photo by Howard Dash-Picacho Mountain Iris.